I am placing a new trade order for the next few weeks using a strategy called dividend capture – triple play with Energy Transfer Equity, L.P. (ETE) underlying. Normally, this strategy is a buy-write strategy where you buy 100 shares of the underlying stock a few days before the stock goes ex-dividend and sell a covered call against the position. If everything goes well, you capture the premium on the covered call, dividend, and maybe a little profit on a stock if you happen to sell higher then your purchase price. If you want to learn more about this strategy, I recommend you to join our trading group on Facebook. There are traders using this strategy a lot and they can help you to explain it and trade it. I can guarantee you that you will learn a lot in the group. However, in this trade, I am going to add another layer to this strategy and I will start selling naked puts first (if you are in an IRA account, it would be cash secured puts or CSP). I guess, I should call this modified strategy a quadruple play then. The company hasn’t announced the ex-date yet but from previous records ETE had ex-dividend date every February 4. Thus we may expect that it will be same case in 2017 and ETE will also have the ex-date in February 4th, 2017. We will however watch this carefully and adjust our strategy accordingly. In order to participate in the dividend capture play we must purchase the stock BEFORE February 4, 2017 to be able to receive dividends. As I mentioned above, I am adding another trade layer to this strategy and in the next few weeks I will be selling puts against ETE. We will be selling weekly puts capturing small premiums every week until the last week before ex-date. Then, a week before ex-date, we will let the puts to be assigned to us so we purchase the stock. However, during this period of time, we will also manage our puts to stay safe. We will roll them if needed to play this game correctly. 1) We will sell 1 ETE Dec30 19.50 strike put and collect a premium (approx. 0.26 credit). 2) If the Dec30 put expires worthless (we will not be buying it back this time) on Friday, December 30, we will sell another 1 ETE Jan6 ATM put to collect another credit. 3) If the Dec30 put ends in the money, we will roll the put into Jan6 either same strike or lower to collect another credit. 1) Now we have a new Jan6 put which we either sold as a new trade or rolled at the end of the previous week. 2) If the Jan6 put expires worthless on Friday, January 6, we will sell another 1 ETE Jan13 ATM put to collect another credit. 3) If the Jan6 put ends in the money, we will roll the put into Jan13 either same strike or lower to collect another credit. 1) Now we have a new Jan13 put which we either sold as a new trade or rolled at the end of the previous week. 2) If the Jan13 put expires worthless (we will not be buying it back) on Friday, January 13, we will sell another 1 ETE Jan20 ATM put to collect another credit. 3) If the Jan13 put ends in the money, we will roll the put into Jan20 either same strike or lower to collect another credit. 1) Now we have a new Jan20 put which we either sold as a new trade or rolled at the end of the previous week. 2) If the Jan20 put expires worthless (we will not be buying it back) on Friday, January 20, we will sell another 1 ETE Jan27 ATM put to collect another credit. 2) If the Jan20 put ends in the money, we will roll the put into Jan27 either same strike or lower to collect another credit. 1) Now we have a new Jan27 put which we either sold as a new trade or rolled at the end of the previous week. 2) This time, we let the Jan27 put end in the money and let them get assigned to us. We buy 100 shares of ETE at the strike price. 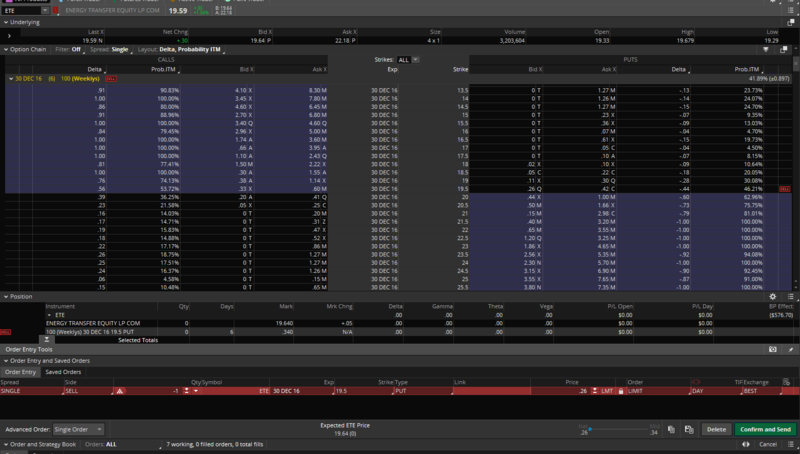 If the option will be OTM before expiration, we will roll it back into ITM to make sure it ends ITM and we get assigned. 3) When we get assigned, we will hold the shares through February 4th and we will be selling OTM calls. 1) Now we have a new Feb3 covered call which we sold last week. We want to be well OTM so we will not get assigned early. If the stock moves higher during the week and our calls end ITM, we may choose to use a covered strangle strategy to move our calls higher. Another option will be that in the case of our calls getting ITM we may roll them into the same strike into the following week to avoid early assignment. If not possible, then we let it be and hope we won’t get assigned early. 1) We still should hold our covered calls from previous week. 2) This week, we are safe to liquidate our ETE position as we successfully passed through the record day (we held the stock before the ex-dividend day). We secured a dividend of 0.285 a share. 4) On Friday, February 10th, we expect our calls to be assigned and we will sell 100 shares of ETE. Our trade will be over. If we happen to sell our shares at a higher price, we will have added profit on the shares too. If the stock continues dropping after assignment, we will keep selling covered calls or covered strangles as long as we get out of the holdings. If you wish to follow this trade live, join our trading group where I will be posting results of each trade week and potential adjustments to keep the trade within the desired range.